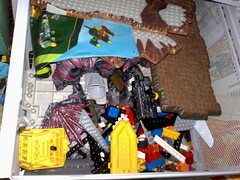 I pour large quantities of Lego into a hopper. The Lego is sorted by colour, shape and size into its original sets, as defined in a freely available online database of Lego set contents. Those sets are offered for sale on Ebay or similar with a reserve price set at reasonable market rates. Subject to receipt of payment, the sets are boxed up and dispatched in on-demand-printed replica packaging. Based on the ages of my children, their anticipated interests and maturity, and current rates of Lego acquisition, I expect to require this service for approximately five cubic metres of Lego (and occasional Megablox etc.) some time in or after April 2019.